East New York City, 1985: a time when crime ran rampant and cars exploded at the slightest provocation. 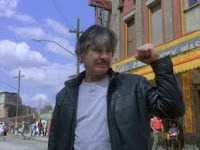 Mean streets indeed for architect/crime fighter Paul Kersey to return to, particularly when played by a then 63 year-old Charles Bronson. Kersey buses his way back to the big city to see an old friend and arrives just in time to hear his final words. His friend had been the latest of many to suffer a violent beating at the hands of local toughs who all look like Adam Ant (including a baby faced Alex Winter). That death cannot stand, will not stand, and the fearful neighbourhood residents have little to do but watch as Kersey takes revenge and causes massive, massive collateral damage. Far more than the prior revenge films, Death Wish 3 is stunningly bizarre. From the off-kilter direction, to the dialogue ("They killed the Giggler, man! "), to the funk/no wave hybrid soundtrack of Jimmy Page, Death Wish 3 is relentless is the best possible way. This was the third and last Death Wish for director Winner and the second from the 80s action producer giants Cannon Films. All parties involved go for broke. The violence comes fast and heavy, and no one is satisfied until city blocks have been completely devastated. And among all that rubble and amorality, wall to wall laughs. As the death toll rises around Kersey yet again, Bronson all but shoulder shrugs his way through his performance. At those moments he does speak (according to supporting actor Ed Lauter, he didn't enjoy delivering lines), his delivery is at once psychotically detached and comedic; which is to say, perfect. He shrugs off the death of his wife and coos over his custom Wildey Magnum (the gun's manufacturer later featured the film in a commercial promoting the same!). Romantic interest Deborah Raffin, playing lawyer Kathryn Davis, also offers a delirious performance and the strangest first date you have ever uncomfortably witnessed. She hates her sister, loves sports, and enjoys taking home brooding strangers after she aids their release from jail onto skid row. Aforementioned Ed Lauter also deserves a gold star for his role as a bipolar cop who salutes friend and foe alike as "dude." Of course, Death Wish wouldn't be Death Wish if our man didn't soundly dispose of all the street trash ruining grocery runs for everyone. Sure, Kersey takes care of the young punks, but to what end? As the film wraps, wild gangs of geriatrics have pulled out their heaters and tasted blood. . . and loved it. If you don't watch this movie you hate freedom. A spotless 35mm print of Death Wish 3 plays again at Toronto Underground Cinema this Sunday, August 1, at 7:00. What I read between the lines here was, "Regan. You have no job. You should rent all of the Death Wishes immediately after you set up the tv in your new apartment today." Was that what you were getting at? Because if it was, I am in total agreement. 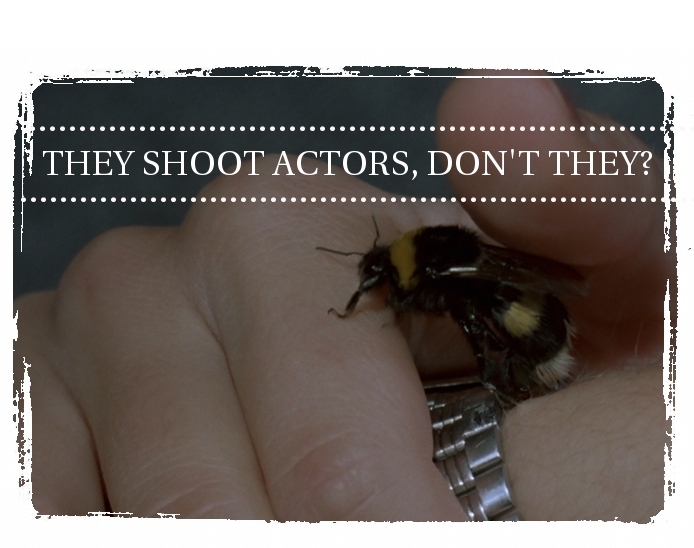 There are actually five instalments, so if you really want to make this project worthwhile. . .